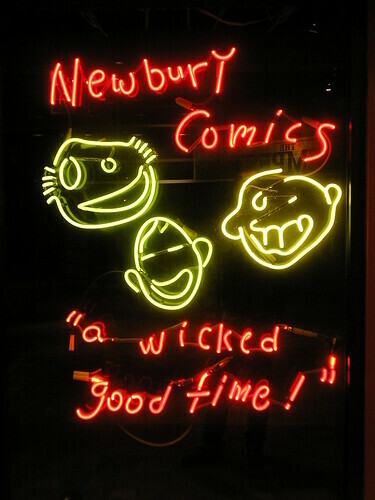 March 7, 2013: It's a WICKED Amazing Fundraising Marathon Time! With co-host Julie. What color is my heart on here? I've never seen H+AI but a bi she-friend who hates conventional musicals totally recommends it. Does it rule? Howdy. I gotta go to work early, and today is payday so I'll be pledging shortly. First things first.... Coffee! but before coffee... wfmu ! Good morning all!!!!!!! Are we ready for a wicked good time? I think it's red to people that haven't clicked on someone's profile. If they have then it's black or white depending on the particular comment s board's color scheme. Changed it up...... didn't want to deal with the sizing...... but I still have my Mass-hole representing! @Caryn: I suppose it is dark blue. Ok..... Let's make my computer ring! really! Let's do it!!! whoa this is a very cool version ! Oh please, until you've properly dumpster-dived, you haven't lived. How much $ to get Julie to kiss Bosco on the lips? She won't lick the floor. Pretzels in the garbage? No problem. Give now, dudes, you're right here!! Wahey youre playing one of my songs!! Merci! And it's a prize! Wow brilliant im so pledging now! Andrea, wait until someone else's mix is the prize! You don't want to win your own stuff! Sliverpool as in Liverpool with an 'S' which is where I am from! Hahaha yeah I wanna win that cd! Yes that's tru I will wait for another mix and I will pledge...would kinda make sense I guess! Andrea, I've always wondered why the "Liver" in Liverpool and the "Liver" in, say, the Liver Building are pronounced completely differently. What's up with that? oh i dont know about Liver and Liver....lots of non-Liverpool people ask that. I suppose we got used to the different words. But hey, Im so glad you like that cd anyway! FTR - I knew an italian dude named Andrea, which is the the equivalent of Andrew. Pledge now to get into the running for Elwyn's cd. Hey! Hey! You're a guy! Hey! Hey! @Andrea - would that difference be "Ahn" as opposed to "Ann"
For that pledge, where's my freakin heart? strange! Where is your heart?!?! Yeah brits say Ann-drea and scots says Orn-dree-a which i believe americans do too....but correct me if I am wrong! So if I pledge now am I in the running for this workout CD? I need one of those! I don't think I was signed into the Friendship Society when I pledged... FECK. I'll hit up Kenzo for the fix. FWIW - I can barely understand Scots to begin with. Yes! You are in the running if you pledge now for a workout CD! @hamburger: the J is pronounced like the Y in "yell"
ok am gonna pledge this minute! Id love it! Something wicked this way comes. Meghan nails it. It's spelt Hëj. I <3 umlauts! Hej Hej! Why the double Hej? ! Isn't Hej Hej hi in..is it finnish? @hamburger: because then it means "bye", the same way you could say "bye bye". Hëj hëj we are de svenska Monkëës ! I'm going to try to go on my own dime. I need to see My Bloody Valentine again. Tony brought you more gravy? You should play a song about a superhero called "Tony's Theme!" Yay! Maybe the workout CD will inspire me to, you know, work out. i'd love to see how the cover art worked out ! I need to allow a non-Finn to get this, so I'll wait for another mix to pledge for. Hey, it's Pyhäkoulu, not Phyhakoulu! @FVH: hey, I have TUB on one of my mixes too! Oh wait, that's on next year's mix... Never mind! Bimboos said they won't have any reunions. ME SO SAD. Thanks Miika! fixed!!! Now how do you pronounce that!!!! pyhä: y like German ü, ä like vowel in "cat". Koulu: the ou like the ou in "soul"
pledge now to get FVH"s cd, you're already on the site, I don't need to read it to ya! I can't figure out how to spell pyhä, but koulu's a bit like "co-lou". it's also got silly sound clips ! danne d - an inspiration to us all! In honor of my first successful wfmu cd... another great song by The Ultra Bimboos... Who Stole My Underwear? Sorry FVH, will fix! on my computer, sometimes it's hard to read on my computer! Make that computer ring!!!!! Come on! We need to make our goal!!!! WE CAN DO IT!!!!! not even 30 percent raised, get in the running for the Dave E Cd! you don't have to wait for payday, you'll get billed later. Pledge now while the cd's are hot! Meghan please do send me an image file for the cover art, I want to see what y'all came up with !
! - Read about Zacherley in 'Monster Show' by David J. Skal. Good book. It's on the other computer..... but I will send it to you! BTW; I'll spend the year coming up with cover art for the other two mixes. Yay for Patton Oswalt-adjacent gravy drinking discussion! Sing a Klaus Nomi song! Let me guess. The name of the CD is... "Hëj Fever !" I'm sad that the first two Degrees of Separation premiums are not available at the prize warehouse. I need those to complete the set! Gotta work - ! 'Be Lucky!' as Roger Daltrey says. So this CD set picks up where last one left off? @Caryn - kinda like the original Planet of The Apes movies? Only 30 percent is NOT acceptable. You underwater folk are like an underwater family (sea monkeys?) Dig out your wet soggy cash and pledge! This sounds like an awesome mix Danne D! For WFMU, this is correct music. COME ON!!!! Let's go!!!! Pledge damn it!!!! Lone Justice! I still have this on vinyl. FMU legends like Pat Duncan and new stars like Amanda Nazario. Maria McKee killed it live too. Does the last song on the new one lead into first song on first one? @KP: I don't think the set is complete yet, so I suspect no. The last song on last years premium links the the first song on this years! Same with all of the others! I had a theory Maria McKee was the girlfriend in the original Less Than Zero. Oh goodie, I made it in time for all the good stuff! :) Hi Meghan! Alright..... we have ONE HOUR left! I need to raise $3000! We are not even half! I have done this before, so let's go! I hope that is next week, Danne D. I am not awake enough for a presentation. I like 'im. I have prawblums. This one serving as Meghan's bed music is off my CD too :) This was from the '02 Meredith Premium. Wow, full crowd looks like :) Hi KP! 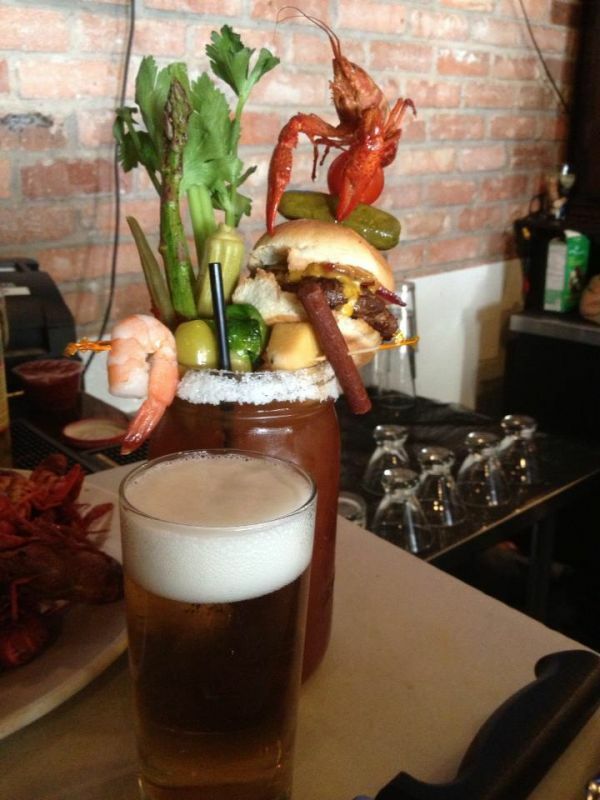 Holy Crap - now THAT'S a Bloody Mary! Danne D, I had good idea for the CD but BGZ insisted on MBV. MBV is so over now I don't remember what it stands for. @ Dave B omg it's more like a meal ! I was wondering too what the hell an upper decker is. now I know. thanks a heap, ken. holy fräk that is the bloody mary to end all bloody mary's. Holy crap! I want that bloody mary!!!! Where do we get that one! Why is my heart black? Don't answer that. Cool :) You guys should be pledging to win this awesome Jenna mix CD :) I am lucky that I didn't have to follow this one! The "Stop! Mannerheim." is TM last year's Marathon comments board, BTW. So, thanks to whoever came up with that. Uh, is there a separate pledge for Cds or something, Danne D? I just got up. @KP: nah, you just pledge. You can mention in the comments if you want to try and win a specific mix cd. And the CD goes to the high pledge of that time span? As long as you pledge, you are in the running for something!!!!!! Come on everyone! I am not even half way! @KP: it's a lottery system. Every pledge card from a specific period is shuffled and the winner is drawn. @KP - there's Meghan's Premium. Peeps get that automatically for $75+ pledges. Right now Jenna's is on the prize block. Meghan has to be able to look Bosco in the eye at the end of this shift people! PLEDGE! Meghan did you see Jeff Moore's tumblr as posted to Joe's show yesterday. And though archive listeners can't win the prize CDs they can still get Meghan's awesome premium - you oversleepers are not off the hook either! Speaking of eyes, is Bosco playing poker ? @Danne: I think we need a link to a soulful-eyed Bosco pic to get people pledging. I didn't oversleep on purpose, I really wanted to catch at least half of Dark Night of the Soul, but alas, no way to listen right now at home. Hopefully next week. clickity click the pledgey button! You too can have me misidentify your gender on the air! Get Bosco's soulful stare and shop it into a "Feed The Children" add. 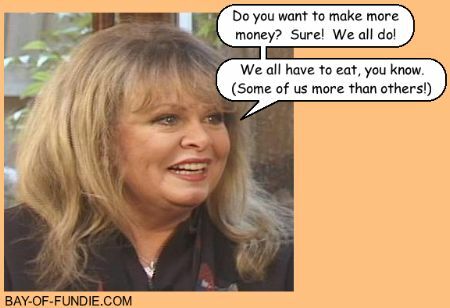 Insert Sally Struthers big bulbous head into the picture for extra oomph! The cow is trying to make friends with animated, but still, Bosco. only a half hour to go and almost 50 percent left to raise. C'mon guys, you don't have to pay now, pay later, enjoy now and always! Cheri Pi, bless your black heart. MOOve cow MOOve cow! Yay! Let's make the dog bark!!!! come on everyone!!!! Bosco will be sad if the dog doesn't get any attention! i was thinking more along the "wicked and weird" lines. so we are not the half naked trailer trash girls? only if you want to be. Come on, let's at least get her to 2000, 15 minutes left! Thanks Danne D!!!! For everything! Admit your love of the band RUSH! Do "Fly By Night" at the Hoof and Mouth. I'm not hearing any ringing, c'mon guys! You, Israel, you can pledge too! Caryn, can i take this home? do you hear these amazing mixes!!!! Come on!!!!! Now I really hope I win! Does BGZ REALISE there's a 15-minute MBV track on "You're My Guitar Hero"? Let's go! A Cluster of CD's!!!!! 4 CD's for a mere pledge of $15!!!!! Go go go!!!!! Caryn, i hope you win. Now I'm annoyed because I can't remember which frigging movie this track was in. oh my gawd! the caryn memory bank has failed. Wait i cant win my own CD! Congratulations. Tim. Thanks for pledging. jay, you dont have to give money, you can use credit cards. Come on!!!!! Last chance, last prize!!!!!! Jay i know the feeling. You can also get billed. Esentially an I.O.U. BTW, glenn, the old brain kicked in again. It wasn't a movie, it was an episode of "John from Cincinnatti".